Improve your life for FREE! 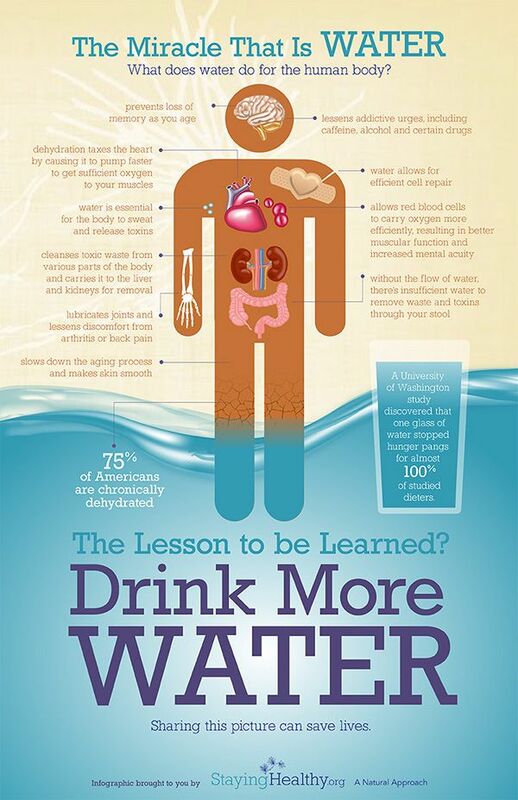 Drinking water is imperative for your overall health. As you can see by the image above, there are dozens of benefits of staying hydrated. But if you're like me, you get bored of drinking water. I bought a cheap $4 water infuser bottle from $5 and Below and it was the best money I've spent in a long time. It's simple to infuse your water. You just pick your favorite fruit and add it to your water bottle! Infusing your water gives you a boost of vitamins and minerals, it's low in sugar, there are very few additional calories in the fruit, and I think infused water tastes better than any soda out there. There aren't any additives or food coloring, you know what you're ingesting, and you can mix and match the fruits you add to your water to find what you like best. I personally like to infuse my water with lemons and blueberries.